In case you missed it there was a great SOLIDWORKS 22-Minute webinar last month entitled The Real Cost of Mismanaged Data, which focused on how companies can improve their design and engineering efficiency by adopting SOLIDWORKS PDM. Now many of you may say that Product Data Management (PDM) software is too expensive, takes too much time to set up and your engineers and designers won’t use it because it will slow down their productivity. Let me try to convince you otherwise. First of all many of you probably already own SOLIDWORKS PDM Standard, which has been included with SOLIDWORKS Professional and Premium licenses since the SOLIDWORKS 2016 release. Second, your SOLIDWORKS Value-Added Reseller can help you get it set up and working in just a few days. Third, your engineers and designers are probably spending more time manually managing and searching for files then they would using if you were using SOLIDWORKS PDM. Find it Fast (Searching): Many of us (yes I’m guilty too) are browsers when it comes to looking for files. We hunt and peck through folders looking for the right file. If we know the file name, we can use the search capabilities in Windows, which may be slow and will most likely return multiple files with the same or similar names because we saved different versions to different folders. Now how many of us browse the internet? Well no one because it really can’t be done; you need to run a search first, then you browse the results. 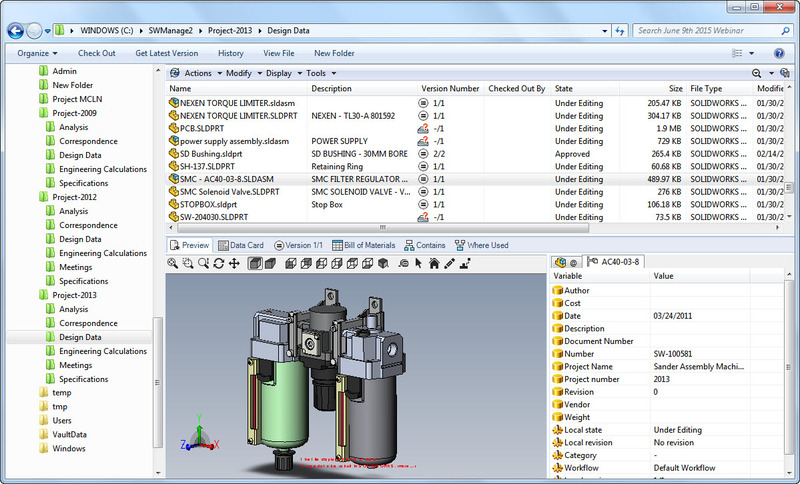 This same workflow can be accomplished with SOLIDWORKS PDM. If you know something about the file, you can search on it, and when you get your results, you have more relevant data available to decide if it is in fact what you were looking for. This includes data like part numbers, descriptions, current release state and even dynamic previews. Smart File Management (Moving and renaming): As a SOLIDWORKS user or as a user of any file-based system that has relationships between files knows that moving and renaming files can be tricky. The issue gets compounded when one file is referenced by several others. To start, how do you know where a file is used? That information may be in a separate system like ERP/MRP. With SOLIDWORKS PDM a file can be renamed and moved just like you would in Windows Explorer because it is Windows Explorer. Keep Changes Easily (Versioning): How do you save versions? Many of you may answer we don’t; we just keep one version of a file. While this may be a clean and easy method, it was probably adopted because easily keeping past versions took too much time and resulted in lots of duplicate files. Others may need to keep older versions because products in the field still use them. So various methods are employed like using Pack and Go, creating folders and copying each version to them, or renaming files with the version information included (in case you forgot see point two above). SOLIDWORKS PDM automatically creates a new version each time a file is checked in and remembers which versions of parts, assemblies and drawings go together. In the 2017 release we introduce version overwrite so you don’t need to store a new version every time. A Full History (Time traveling): What good would previous versions be if you couldn’t easily access them and know who, why and when created them? SOLIDWORKS PDM makes this extremely easy. When working in SOLIDWOKS you can load previous versions into your session to see what a design looked like in the past and determine interchangeability of new versions of parts with older versions of an assembly. You can even use the compare functions in SOLIDWORKS Utilities with different version of the same file. This really useful for finding small changes in geometry, features and properties.